It will help them begin the new year with a practical guide to using their digital devices more consciously and getting more out of them in the process. You might just end up reclaiming your bedroom, dinner table, and meeting rooms in the the process! “An exciting book – full of hope for the future”, Sue Palmer, author of Toxic Childhood. 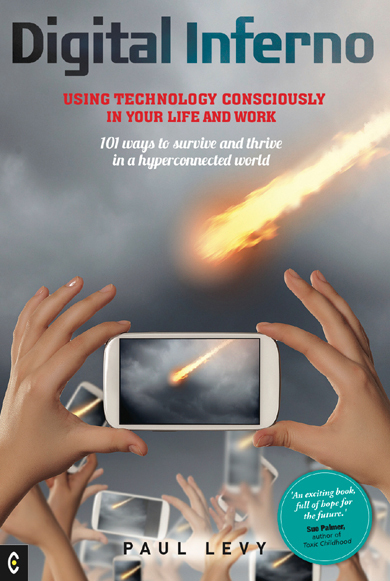 Full of practical activities, tips and smart advice, as well as taking an uncomfortable deeper look into the digital realm, Digital Inferno is a gift on several levels at once: a gift to someone who is getting digitally addicted, to someone who doesn’t want to avoid the digital ream, but is worried they may be surrendering too quickly and too much to it. It might just be the most useful and beneficial gift you have given someone in years! Digital Inferno offers a guide to staying conscious in the digital realm, offering over a hundred tips for holding your own and staying in control. Facebook, Twitter, texting, snapping every moment with a camera – this might just be the present that gives those you care for, real presence in the world again. You can buy Digital Inferno from Amazon in your country. Buy it here in the UK in paperback. Or here on Kindle. Buy it here in the USA in paperback. Or here on Kindle. Read Bookbag’s glowing review here Or a longer and excellent review in the Irish Times here..
Posted on November 24, 2015, in Key themes. Bookmark the permalink. Comments Off on Give Digital Inferno to someone you love or care about this Christmas.